After looking back through many of my outfits this summer, I've decided that this outfit feels the most like a summer uniform. These boyfriend shorts are a classic style and work with almost anything in my closet. I bought them in a high waisted style as well, but I love the slightly looser fit of these. The distressing is enough to give the shorts some character but not to fall apart in the wash as has been my struggle with other ripped styles I have. 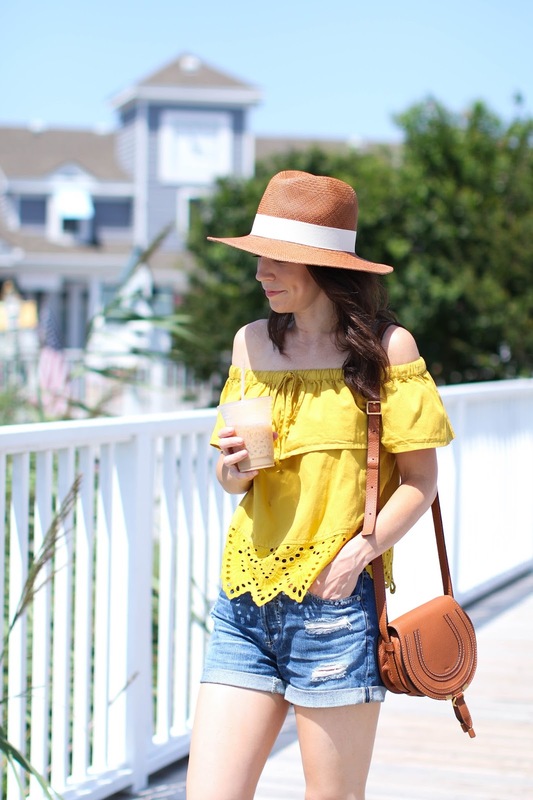 Wearing another off the shoulder top should come as no surprise since it's been quite a theme for me this summer (remember this post, this post and this post), and this one in particular allows for a great deal of arm movement which makes it a winner in my book. 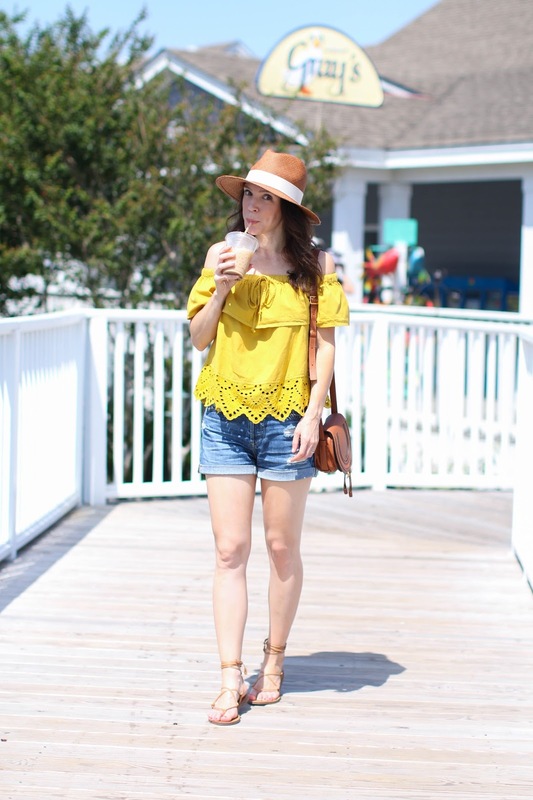 Of course finishing the look with my large panama hat and wrap sandals because they go with almost all my summer outfits. I'm working on putting together a post on my current foundations that are getting me through this heat wave we are having. I like to have coverage most days, but can't deal with my skin feeling suffocated. I keep reaching for the same ones over and over so I figured a round up was in order. I know summer is a time to enough the outdoors, but I have to be honest and say that I dread going outside now. I always feel guilty for staying indoors during the summer since it seems as if I should be out enjoying the weather/sun/nature/whatever, but I can't help but retreat back inside when it gets above a certain temperature. But curling up on the couch watching a movie on a bright sunny day just doesn't have the appeal it does when it's cold, rainy or storming. I would love to hear what activities you like to do in the summer to deal with the heat or even avoid it? Leave me a comment below!